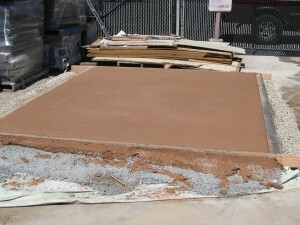 Don’t tell anyone, but Lyngso Garden Materials in Redwood City, CA can make pervious concrete! We just helped them to make a yard of pervious concrete out of their little batch plant and it worked great. We put it in the back of one of their special concrete dump trucks, drove around for awhile and emptied it out over a half hour later and it was still nice and wet and fresh. After placing Lyngso’s pervious concrete, naturally we placed our PerkTop™ on top. We just saved our 4th client in less than a year from the mess between their flagstones! These are all ‘retrofits’ from previous jobs and the clients were fed up with the messy fines. We’ve also installed at least 4 jobs using our grout for our own new flagstone set in sand installations over the last year as well. This job was particularly easy since almost enough of the fines had already washed out from between the stones and we pretty much just had to sweep out a bit, blow and we were ready to install PerkGrout. The contractor who originally installed this flagstone in sand patio did a very good job, note the nice large stones and the tight, consistent joints. Because of this we were able to get very good coverage with our grout, about 1/3 lb/square foot. My apologies for not posting in awhile, but I have been focused on trying to get one of our pervious concrete products out to market. I am happy to report that ‘PerkGrout’ is now available to be purchased at Lyngso in bags! 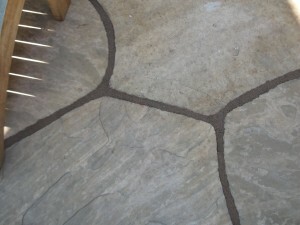 PerkGrout is a solution that our clients regularly choose for filling the joints of their flagstone set in sand. The typical solutions of fines or gravel are messy and hard to maintain. And the other flagstone joint solutions that are on the market today are either impervious or aren’t very durable. 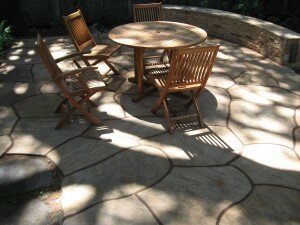 Our solution adds a little to the costs of installing a flagstone in sand patio or path, but considering that it makes maintaining it so much easier, one will recoup their investment in no time. Porous concrete has been a passion of mine ever since the second job we did with it failed in 2006. The surface had raveled, it became loose like gravel, starting a couple of months after it was installed. At the time I was unaware just how sensitive this product can be. I take some comfort these days now knowing that I wasn’t alone in my underestimation of how tricky pervious concrete is to install. As it turns out around 50% of pervious / porous / permeable concrete installations are considered failures. This is true in spite of the fact that it has been used in the U.S. for over 30 years now. Since that initial failure I have dedicated myself to making our porous concrete installations more reliable. We certainly can’t afford to go replacing half of our jobs. In the process too, I decided it should be better looking. Regular pervious concrete with its chunky, rice crispy treat looking appearance may be acceptable for certain industrial applications, but it isn’t a realistic aesthetic option for most of our residential clients. The result of this dedication incorporating years of research & product testing, is what I call’PrettyPervious’. PerkTop™ is more of a process than an actual product. The process has to do with overlaying a thin layer of a finer, colored pervious concrete over regular pervious concrete, as it is being laid and is still in its plastic state. The aggregate in PerkTop™ is so fine that from just a short distance the concrete looks like regular concrete and it certainly doesn’t look like it has the permeability that it has. Our clients are always surprised at how much water just flows right through that tight, smooth surface. Sometimes they even break out their 9″ stiletto high heels and parade around on it or don their roller skates and glide across it, because they can do these activities on our very ADA compliant version of pervious concrete! By the way, the job that failed, we were able to make good on. In the process of creating PerkTop™, we discovered that we could also make a version of it that was capable of overlaying on cured pervious concrete. Therefore we removed the loose, raveled stone to get to the solid base and applied our modified PerkTop™ on top. We now have a solid, attractive expanse of pervious concrete, without having had to remove and replace all that material. How to make porous / pervious concrete for homeowners. If you are a homeowner and you’d like to do a little area of pervious concrete, aka porous or permeable concrete, you are going to have to make your own mix, because pervious concrete is not typically available in bags. Fortunately the basic ingredients for pervious concrete are simple. 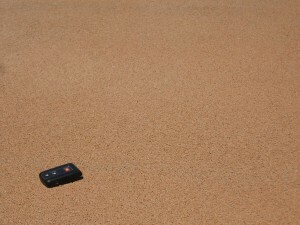 They are the same as regular concrete, rock, sand, cement & water, but minus the sand. UPDATE: We finally did a video for this and it does a great job showing how to get the just the right amount of water in your pervious concrete! The rock is generally a 3/8″ pea gravel that should be readily available from your local rockery. But really almost any rock will do as long as it is clean, meaning no or little dirt or fine sand is in it. Round or angular rocks are both okay. For aesthetic purposes the smaller the rock the nicer the final product will look. Though a word of caution here, because the smaller your rock is, the more angular and/or uniform in size it needs to be or your concrete won’t be pervious. We have mastered this process with our PerkTop™. The cement portion refers to any type of Portland cement, type I-II, type III-V, etc. Get whatever they have at your rockery or local hardware store. When you are filling your container, do not pack the cement or you will end up with too much in your mix as cement does compact quite a bit. The water portion is the trickiest part of your pervious concrete mix to get right. Don’t feel bad if it takes you a couple tries to get the hang of the what the right amount of water is, because even the professionals have a hard time with this one. Unlike regular concrete, the correct amount of water to add to pervious concrete lies within a very narrow range, if you add a little too much you could end up with impervious concrete and if you add too little you might get raveling (loose rocks on the surface) later. The general rule of thumb to know if the water amount is correct is to make a ball (wearing gloves of course) and the ball should hold together and have a nice shine to it. Note: If your rock is pretty wet to begin with, you probably will need to add very little water to the mix. When we mix our pervious concrete by hand, I like to always be in the shade. Pervious concrete is very moisture sensitive and once you’ve worked so hard to get that moisture just right, you don’t want it drying out before you have a chance to finish placing it. Again pervious concrete is not like regular concrete, pervious concrete will dry out very fast and you generally can’t retemper it (add water) to bring it back like you might for regular concrete. Now that you know how to make your own porous / pervious / permeable concrete, whatever you want to call the stuff, check back in later to find out how to place and cure it. Posted in Pervious, Permeable, Porous Concrete | Comments Off on How to make porous / pervious concrete for homeowners. Following up on my last post concerning the amount of cement in pervious concrete and all concrete. There is a very easy way to reduce the amount of cement in any concrete flatwork. Simply pour it thinner, as thin as 1 1/2″ and add control joints about 12″ on center. We call this type of concrete work ‘thin concrete’ and for us it is a little more involved than simply adding a bunch of control joints. Besides adding all those control joints can be a little too much work! We have a whole process we implement, which you can learn more about in the energy conservation section of our website. First I want to address cement alternatives, and I’ll forewarn you that I am a little cynical these days. A lot of hoopla has been made about finding a replacement for portland cement or more commonly replacing portions of portland cement in concrete. While it is true that fly ash and slag in particular can replace various amounts of cement and still leave the concrete with the same strengths or even greater than it would have had with 100% portland cement, I feel the environmental benefits that are touted for doing this are overrated. One big factor that is overlooked is the amount of transportation that is involved in getting both of these products to us here in the Bay Area. I believe most of the fly ash that is used locally comes from Wyoming and the slag generally comes all the way from Asia. In addition as the EPA grapples with how toxic of a substance to define fly ash as, I think there ought to be concerns about the long term ramifications of using these products in our concrete. For instance, what will become of it when it is crushed up to be re-used as base rock 50 years from now? The cynical part of me questions why & by whom these cement alternatives are being pushed so hard? I also wonder why such elegant, immediately implementable solutions such as pouring concrete thinner which could easily save 50% of the cement (and 50% embodied energy and 50% less pollution), aren’t discussed and encouraged? During a conversation with one of my colleagues at the Bay-Friendly Conference, she reminded me of an earlier environmental concern I had when I first started working with pervious concrete several years ago. The concern was regarding the amount of cement in pervious concrete, or for that matter in any concrete. Cement, the main binder used in concrete, is energy intensive to produce, emitting approximately one ton of Carbon Dioxide for every ton of cement that is created. Considering that cement accounts for approximately 14% of the volume of concrete and knowing how much concrete can be used even on a single job, in this light it would appear that concrete has a large environmental footprint. I am not saying it doesn’t. I’d just like to make a couple key points that I have learned over these past 8 years or so that I have been dedicated to finding and creating more environmental hardscapes. In that oft-sited statistic about one ton cement = one ton CO2, what they don’t tell you, is that half of the carbon dioxide that is emitted is as a result of a chemical reaction in the limestone as it is being turned into Portland Cement. It is well known that once concrete is placed it recaptures some of that carbon where it can, which is typically only on the uppermost exposed surface. So in the case of pervious(porous, permeable) concrete, with voids throughout the entire matrix, there is a tremendous amount of surface area exposed to the air and therefore sequestering more of that carbon dioxide that was lost during the limestone’s transition into cement. I do not know what percentage of carbon dioxide is recaptured. I believe it is fairly significant as there have been studies showing how when concrete is crushed at the end of its lifecycle to be re-used, it actually carbonates then, and within the first couple of months re-captures up to 40%(exact # needs to be verified) of the carbon emitted during production. The second point I would like to make is that most cement is produced locally. In our case it is literally produced within walking distance of our office in Cupertino. The old Kaiser plant is one of the largest cement kilns in the country. I believe that most other products aren’t produced this close to home, and I believe that fact is usually minimized in any discussion of how ‘green’ a product may be – that transportation is never given its full environmental weight. I realize concrete is not environmentally benign, but hopefully I have been able to offer a more objective view of its true environmental footprint. At the end of the day, generally the best thing for the environment is no hardscape or at least less of it, unfortunately this is not always practical. Gravel and decomposed granite/fines and others can be more environmental hardscape alternatives, unfortunately they generally have lots of maintenance issues. Due primarily to this reason, I think we are going to be stuck with a little concrete for some time to come. And if we have to put in concrete it might as well be pervious, so water can stay onsite and the soil can breathe underneath. Another successful sustainable landscaping conference put on by Bay-Friendly and StopWaste.org! There were well over 400, probably more than 500 landscape professionals in attendance. I love being a part of any of their very well organized, professional events. This year was no exception as for the first time I got to be a vendor in one of them. We were displaying our latest phenomenal achievements with pervious concrete, what we call PerkTop. I am very grateful for all those who expressed interest in pervious concrete and gave their positive feedback to our PerkTop. A number of people asked for PerkTop samples and know that we will get those out as soon as we can in the next week or so. Thanks again to all those that attended the Bay-Friendly conference and helped make my day by sharing in my love and passion for PerkTop, the ‘aesthetically acceptable’ form of pervious concrete. EarthCare Landscaping will be present for the Bay-Friendly Landscaping Conference on Sept. 17 at St. Mary’s Event Center in San Francisco. This Conference / Trade-Show is the place to go for all serious environmental landscape professionals. It is a very well organized and run event. There will be over 400 attendees which directly relate to EarthCare Landscaping’s pervious services. “We at EarthCare Landscaping want to introduce to the greater community our amazing aesthetic accomplishments with pervious concrete,” said Ryan Marlinghaus, president of EarthCare landscaping. Mr. Marlinghaus will be attending the conference and will be available to personally answer all questions related to pervious concrete in general and describe our unique solutions. “Transforming Urban Landscapes to Protect Our Water Resources” is the theme of this event and pervious concrete is a well-recognized practice in achieving this. EarthCare Landscaping was founded in Cupertino, CA in 1994 by Ryan Marlinghaus. Since its inception EarthCare has been dedicated to preserving the environment including people & their pets. We have performed over $15 million in landscaping work over these last 15 plus years. All this work has contributed to a sizable savings to the environment, go to How We Do It for more specifics. We are a small company, currently employing 12 full time dedicated landscapers, go to EarthCare Team to learn more about us as individuals. We have had our share of ups & downs, but have always stood behind our word on the rare occasions when things didn’t work out right. We feel this approach is a major contributor to our large, continual base of loyal customers. We deeply appreciate all the relationships that have happened over the years and the trust & respect our clients have shown us. We endeavor to treat our employees with the same respect afforded us by our clients, which is probably why our employees tend to stick around. The average length of employment for an EarthCare employee is over 6 years. Most of our employees already came to us with landscaping experience as well, so combined we have an awesome amount of landscape know-how. We pay our employees livable wages and share the profits of EarthCare with them as well. We have primarily done residential remodel work, but we are interested in doing more commercial scale pervious concrete work. Our installation jobs vary in scope considerably, between $1000 & $150,000 in cost, with $40,000 being about the average these days. We have gained a reputation for providing very thorough & detailed bids, go to an installation bid to see why. We do not negotiate on our bids, only on the scope of the work. It doesn’t matter where you live, your age, gender, ethnicity, etc., we charge fixed costs that vary only due to site conditions & materials chosen. Despite our commitment to sustainability and its sometimes more labor-intensive approach, we are able to keep our prices very competitive. On average this extra labor burden only adds 3% to the total cost of a project. We strive in all aspects of our business to keep our overhead down and our operations running efficiently so that our costs to you are minimized. It is a thin margin business. We hope to make 10% net profits for the year & when that is achieved, half of it is shared with EarthCare’s employees. EarthCare values its place in the community, so thank you for taking the time to visit our site and considering us for your next landscaping project!